How many of you set your alarm clock for some ungodly hour, or stood in line all night for Black Friday this year? It has become a true spectacle kicking off holiday shopping – whether people want to get a head start picking out gifts for loved ones, or just want to find a highly-discounted gift for themselves (you know who you are!). For more than who would like to admit, the holidays have become synonymous with wish lists and presents. That’s why I felt it was especially important to sit down at my computer and write about the importance of remembering the true spirit of the holiday season. It’s no secret that I didn’t have a lot of money when I was growing up, but even when I was at my lowest point financially, I would always set aside a few dollars here and there to put into a small “Christmas Savings Account.” There seems to be this misconception that I have always and will only shop at Saks Fifth Avenue, Barneys New York, and the like, but that couldn’t be further from the truth. When my children were growing up, I would often take them shopping to stores like K-Mart, and every year around Christmas time we would pick the name of a child in need off the “K-Mart Tree.” Even though we didn’t have a lot of money, we all understood the gift was in the giving, and would make sure to pick something out for that special person whose name we had chosen. We also knew that the gift didn’t necessarily have to be expensive to make someone’s day. For example, you can stop into stores like Target and find a quality pair of mittens for less than what it would cost, say, for fast food (and much better spent). I was blessed to have a family who instilled this valuable lesson in me from the beginning, and I paid it forward by teaching my children the importance of giving. It’s so wonderful to watch them carry on this tradition with their own children year-after-year. My kids have all “grown up,” and they are all extremely generous – many of the Consultants will agree that my first-born son, Chris, would give the shirt off of his back to someone in need! All of the Consultants and staff at Pure Romance are also our family. That being said, it made perfect sense to share this same tradition with our employees (and through this blog – with you!). 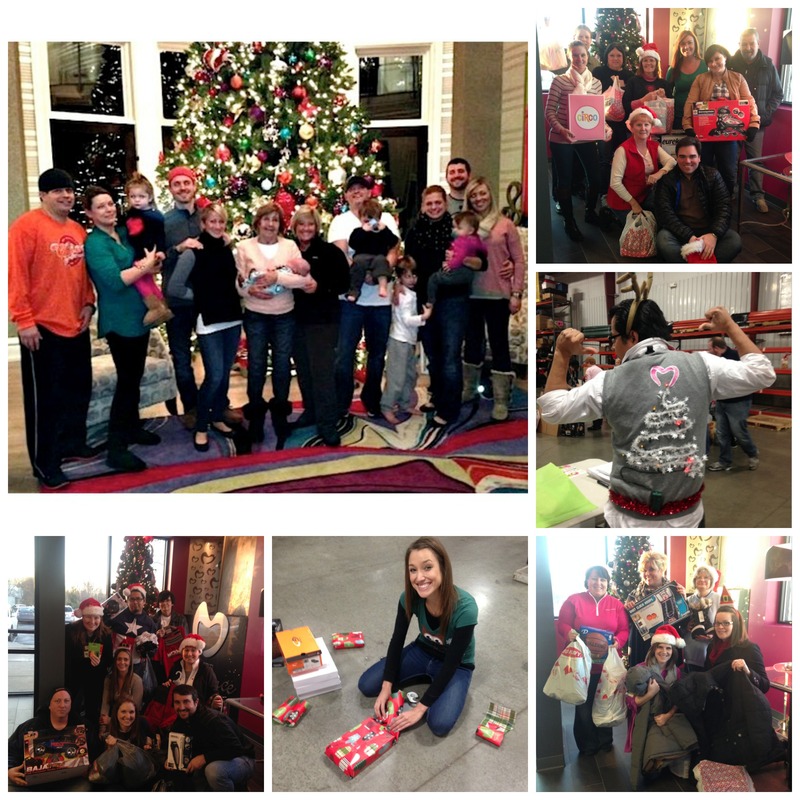 We annually participate in a family gift drive around the holidays and adopted 10 families in need this holiday. All of our employees were divided into teams and given $500 for each family. After going on a team shopping spree, we reconvened in the office to do a group wrapping party and then delivered everything in time for a very magical Christmas! We not only shopped for the children, but also the parents, so they too could enjoy a holiday surprise with their family. Our employees LOVE this tradition and truly see the reward as twofold: true, the person on the receiving end gets the gift, but it’s the careful thought that goes into selecting the present, and the giver’s ability to see how happy it makes the person which makes the giving 10x better. That’s when she broke down and told me, “Ma’am, I’m really sorry. I’m going through a really hard time; my boyfriend broke up with me and I’m not dealing with it very well.” Despite the line forming behind us, I took that moment to let her know from the bottom of my heart that these things happen in life, and when one door closes, another truly opens. I told her that later in life she would see that even as painful as it was, there was a reason and lesson in this. There was certainly a lesson in this incident for me, as well. I could have been self-consumed and presumed she had a problem with me or just hated her job, etc., but giving her my ear and openly addressing her allowed her to find help in even a complete stranger. There are always so many people you can connect with out there if you are truly open. As I was leaving, I bought a gift card at Starbucks and brought it back to her. I told her that she needed to do something nice for herself and to give herself a nice treat on her way back into work the next morning. And believe me, it felt so good to give her my time and just that simple gift card. There are so many ways we can help one another. Whether it’s reading stories to ill children at Children’s Hospital, tutoring underprivileged children, participating in Big Brothers/Big Sisters, bringing games to a nursing home or just sitting and talking with someone who is lonely, there are a million opportunities to give your time without spending a dime. It could be just as simple as handing a couple bucks to the person who falls short at the grocery store. These gestures should be top of mind all year round and not just at Christmas time. I read an article recently by a woman who really understood this. She decided that for her 30th birthday she would do 30 good deeds and guess what? She said it was the best birthday she’d ever had. I just turned 58 this past August…I know, 58 good deeds in a day? That’s more deeds than there are hours, but let me tell you, it can be done and next year it WILL be done! We all know my birthday falls during World Conference, so I’ve decided to pick a special day to do my 59 good deeds in 2014. I challenge you to do the same and this Christmas, remember: not everything in life has a cost. I encourage you to share your own stories in the comments section of this blog of how you have touched someone’s life this holiday season and realized the true reason for the season! We wish you a Merry Christmas from all of us at Pure Romance! 4 Responses to "The Gift of Giving"
Just today, while I waited in line at Krispy Kreme drive thru for my coffee and donuts, I noticed a car behind me with a young father and two small children singing ‘Frosty The Snowman’ while waiting on their order. The smile, laughter and innocence of the children just struck a cord with me. So as I paid for my order, I also paid for theirs. Just $6 and some change…but the father took it upon himself to get out of his car as we waited to exit the parking lot to say ‘God bless and Merry Christmas ma’am’. It just does a heart good to pay it forward. Made my day…such sweet children and a well mannered young father. Patty , I LOVE this article! My husband used to be in awe when I would be extra kind to someone working a job she/he hated. Or they may just have a lot happening in their lives. A kind smile and an ear can make the difference between someone carrying out plans to take their own life and them deciding they are worthy. He’s used to it now and is still In awe 15 years later. Most People aren’t rude by nature, so everyone should try turning someone’s frown upside down and they will be touched to know they made a difference. Your story is why Pure Romance is what it is! You’ve walked both sides of life and you show women that they can get through anything ! Thank you for all you do! Merry Christmas ! In honor of a very strong and loving father who’s Birthday is on Christmas Eve, our family sponsors another family so they can have a brighter Christmas.